What Genetic Ingredients Make Up a Sport Horse Recipe? Sport horses, those that are used for the Olympic style sports are usually not pure-bred, although they can be. The great majority have a significant amount of Thoroughbred in their lineages. Your goal is success in a particular sport and therefore your selection criteria will vary with the demands of the sport and your expectations and goals. So, most breeders will end up following a rough outline of genetic components to reach their goals--a basic sport horse recipe. Because of the unceasing revisionist history being doled out to the modern equestrian that the breeding of sport horses, especially in America, is something new and only developed in the 20th century by the Europeans, let me remind you that the Anglo countries have been breeding and testing this same type of horse for centuries--it was always called a Hunter until recently.The ingredients then and now are basically racehorse alone or mixed with other breeds. Racehorse- for pure athleticism, proper saddle horse conformation, speed and stamina. Thoroughbred is the major source for these traits, although another option could be the Standardbred. Saddle Horse- for style, movement or elegance and specialized talent. Often called improvers, these breeds are added to adjust the abilities of the horse for each sport. Key providers are Anglo-Arab, Saddlebred, the Morgan, Selle Francais, Swedish Warmblood, Trakehner; also consider Arabian, Quarter Horse, Tennessee Walker and Missouri Fox Trotter. Coach- these coach horse derivative breeds contribute height, weight carrying ability or substance. Continental Warmbloods (Hanoverian, Holstein, Oldenburg etc) Irish Draught, Cleveland Bay. These are the basic ingredients you will commonly find in those horses that succeed in Olympic style sport--either used as a pure-bred or mixed and matched to produce the product you want. Your recipe for success will depend on your sport goal. How much of each ingredient do you need to use? The sport of dressage can stand a greater proportion of substance and still succeed, but the three-day horse and the show jumper need the speed and agility that only comes from the lighter horses. Your sport goal will determine your ingredients and the amount of each. You will want to further refine your ingredient list by identifying which particular bloodlines in these types is a source of superior sport ability, good temperament and soundness. And which ones will improve the genetic package you are building into your herd--this in turn will require a familiarity with the Tesio Methods and also the study of the bloodlines. Here are a few examples of proven sport bloodlines close to the root source of sport: In the Thoroughbred the line of Nearco has proven to transmit both the beautiful movement needed in dressage and sport ability for jump and Fair Play and his descendants are winners in jump and eventing. In the Standardbred the bloodline of Adios and his full sister Adieu produce spectacular balanced movement that succeeds at dressage, and we find Guy Axworthy ST and Volomite ST in the top show jumpers. These bloodlines are just a few of proven transmitters of superior sport talent, and are far more concentrated in these talents than a draft horse based breed carries. In order to become free to truly be creative and prosperous in you breeding designs you need to learn your breed components and recognize which sport factors come from which breeds. If you do not understand where sport performance arises from you will continue to be misled and continue to believe the European horse is made up of something special your own stock does not possess. 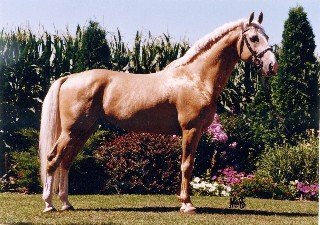 When actually the truth is the opposite--your American breeds contain more of the proper genetics for sport than theirs does, and the modern European sport horse only has sport ability now because it took in the true sport breeds from England, Ireland and even some created by us Americans! (You can read details of this in Legacy of Lexington and Standardbred Sport Horses). We desperately need a reset in our understanding of sport and its roots. We have been dominated in literature generated by European warmblood interests for thirty years now with the sorry result of their self-serving vision becoming the accepted 'history'. Unfortunately they got more than a little carried away with themselves, and even more tragically the rest of us didn't realize the long con being played on us. However, they have over played their hand, boldly one and all making statements of 'centuries of experience' in a fabled inspection system and in sport horse breeding. To this end of rising in worldwide influence they had to knock some of the rest of us down to a manageable size, by setting up a breeding monopoly which blocks all non-European breeds, along with a constant denigrating of other sport breeds (see While You Were Sleeping for more on this). Well, I for one have had enough and having done my homework I can stand up and knock holes in their lies. After decades of pedigree database building, tracing of bloodlines and sport history through the ages, I came to the knowledge that no matter where you find high sport performance in the equine, it always originated with the racehorse: galloper or trotter or pacer--lines that themselves arose from the Irish Hobby and English Running Horse, not some mythical European centuries old sport breed. For example, I recently extended the lineage of the dressage icon Donnerhall OL to see where his talent came from. I had made an error in a portion of pedigree, and when I entered the correction and re-assessed his genetic value I decided to trace it back to its source. And here is what I found: every quadrant of his pedigree went back to additional massive Thoroughbred infusions onto the stock that was made from the importation of the racing-coaching-hunting stock of the British Isles. The German source bloodlines are absent--not recorded if there are any. I don't know why this took me by surprise in Donnerhall's case, because this is what I have found every-time I have extended any of their pedigrees. That they took their agricultural base and added first the racing-coaching--hunting stock of England-Ireland to lighten up their stock to get a better coach horse: mainly through the Mecklenburg stud in the mid and late 1800s, and in the late 1800s the East Prussian took in massive infusions of Thoroughbred. The French took in Thoroughbred and Trotter starting in the early 1800s to change their heavy Anglo-Norman base into a lighter coaching type and to create a fast trotting racer. 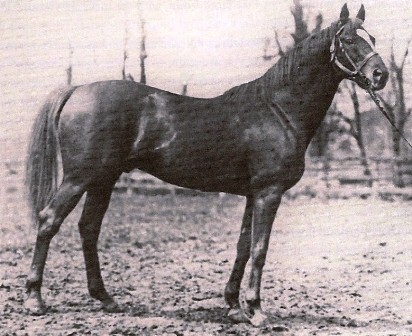 All continental programs through the 1900s added additional racehorse, both Thoroughbred and Trotter, until they could perform in the modern sports. Need more proof? Take alook at my revision of Loretto HO, where I also extend his antecedents and discover that the www.Holsteiner.org claim of 700 years for their breed is a ridiculous fantasy. 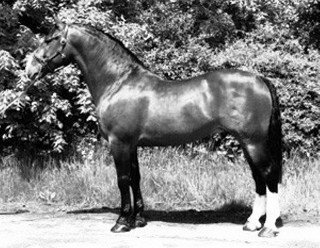 Or visit the Hall of Fame dressage page where I looked deeper at the genetics of Duellant HA, who is significant in four of the six entries, finding his dominance is in a early Thoroughbred, not some special German dancing horse. So where is the German developed breed lines that are the result of their 'centuries old' inspection system? I can't find them--the only recorded bloodlines of dominance are all Anglo, and even the European base that they were crossed into is unrecorded once they get to mid-1800s! But isn't the continual cry that first of all they have centuries of experience breeding these horses and then second, that their inspection system is also centuries old? Maybe I understand this wrong, but I have read for decades in their trade journals that in their 'superior' inspection system the prospective breeding stock is inspected, rated and of course recorded, with comments and pedigree. Am I wrong in this? So where are the bloodlines? How come they are absent? As a breeder who wants to succeed you will need to examine your own stock's lineages to determine the important transmitters of sport they already carry and then choose their mates from those that build on or improve the genetic package that will become the foal. It is just as important that you carry an understanding of what sport genetics arise from so that you don't just accept the sales chatter you are subjected to continually. You are the creator of your sport product, so it is up to you to clear away the lies and half-truths to find the true sport bloodlines for your success. You future as a breeder depends on your diligence.